By John ~ October 16th, 2013. For many years, I’ve heard Barolo referred to as the “King of Wines”; but when I looked at a glass of Barolo, it looked like a wimpy wine because it was light red in color and somewhat transparent. Consequently, I had a hard time getting excited about it, especially when I looked at the price tag on what was touted as a good bottle of Barolo. However, after our trip to Italy’s Piedmont region this past summer, the home of Barolo, I’m now a believer (and I believe that the black, opaque Riedel glass is perfect for Barolo). Even though they don’t look like it, Barolos tend to be rich, deeply concentrated, full-bodied wines with pronounced tannins and acidity. 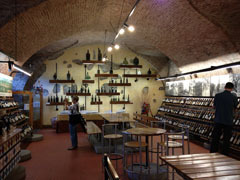 The eye opener for me came when we visited the Enoteca Regionale del Barolo. Not only did they have fantastic exhibits about the history of the Barolo zone and the establishment of the Barolo DOCG, but also they had a great tasting bar and knowledgeable English-speaking staff who could tell the Barolo story. The Barolo zone is located in the Langhe Hills of the Piedmont wine region, southwest of the city of Alba, in the Cuneo province of Northwest Italy. One of the most significant things I learned on our visit was that the Barolo zone consists of production around eleven different communes (towns) with three distinctly different soil types. LaMorra, Cherasco, Roddi, and Verduno area vineyards are in lighter sandy soil and produce less tannic, fruity Barolos. The Barolo and Novello areas consist of a mixture of sand and clay and produce wines with a more harmonic bouquet that are fairly tannic. The soils of Castiglione Falletto, Montforte d’ Alba, Serralunga d’ Alba, Diano d’Alba, and Grizane Cavour are clay and produce the big powerful Barolos that are intense and structured. Historically, the three main Barolo towns were Barolo, Castiglione Falletto, and Serralunga d’Alba. Even today, almost 90% of all Barolos are produced in those three plus Monforte d’ Alba and La Morra. With this new knowledge, I can match up the type of Barolo I’ll most likely prefer and buy from a producer in that commune, which will be listed on the label. While Barolos have been made for over a century as a dry red wine, vintage variation was historically high because the Nebbiolo grape (Barolos are 100% Nebbiolo) is a slow-ripening grape with harvest taking place in mid to late October. 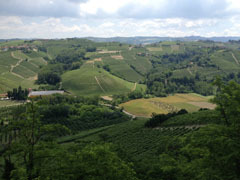 In more recent years, global warming has had a beneficial influence on the Barolo zone with increased summer temperatures followed by mild autumns, contributing to a string of successful vintages over the last twenty years. Traditionally, Barolos were produced by fermenting the Nebbiolo grapes on the skins for at least three weeks, and then aging them in large, wooden casks for years. To be labeled as a Barolo, the wine must be aged at least 3 years; a Barolo Riserva must have 5 years of aging. In recent times, more modernist producers began to cut fermentation times to around ten days and then aged the wines in small barrels to cut down on the tannins and make the wine more approachable at a younger age. 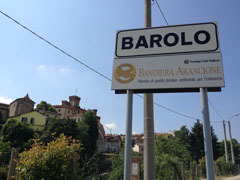 The controversies between traditionalists and modernists have been called the “Barolo Wars.” From the Barolos that I’ve tasted, it appears that weather along with advances in viticulture, such as better canopy management and controlling yields, have led to riper grapes being harvested earlier with more developed tannins, while preserving fruit flavors and aromas more than in the past. While our resident Wine Peeps food expert, LaGayle, could give you many good pairing suggestions, I noticed on our trip that Italians typically pair their Barolos with meat dishes and heavy pastas. While good entry level Barolos often tip the scales close to $50 per bottle and the best, older vintages, in the hundreds of dollars, Barolos age very well, and many aficionados won’t drink one less than 10 to 15 years old. Two good entry-level Barolos that I would recommend are the Paolo Conterno Riva del Bric Barolo (Montforte d’ Alba) at $37+, and the Vietti Castiglione Barolo (Castiglione Falletto) at $38+. I tried the 2008 vintage of each, which were both still a little young but have an excellent future with good aging potential. I encourage you to give Barolo a try. If you like robust red wine, I believe you’ll like it.